While we feel that every month should be Military Appreciation Month, the entire month of May is dedicated to honoring and remembering our nation’s military, culminating with Memorial Day. Military Appreciation Month is the perfect time to thank a veteran, remember the sacrifices they made, and teach the next generation about the true meaning of Memorial Day. Decoration Day, as Memorial Day was originally known, was conceived in May 1868 and was first observed at Arlington National Cemetery to bring together the families of the fallen to help heal the wounds of a war that had threatened to tear our young nation apart. The tradition endures nearly 150 years later at national cemeteries across the country. This Monday, as a nation, we will observe Memorial Day. It is not just for barbecues, shopping, or having the day off from work. It is a day when all Americans should remember and reflect upon those who have fought and died for our country and who now lay in peace. 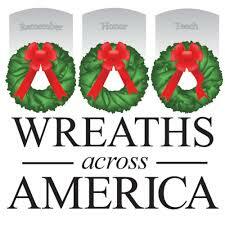 Please consider being a Sponsor for a wreath for this year’s upcoming Wreaths Across America Day on December 15th 2018. The Historic Clarksburg WV Cemetery Preservation Alliance receives $5 from each $15 Wreath sponsorship as a way to fund our continuing mission.